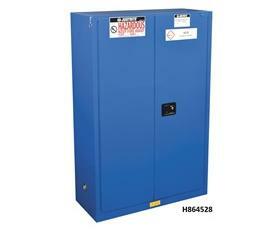 Identify and safely store hazardous materials such as acids, bases, oxidizers, or toxic materials. 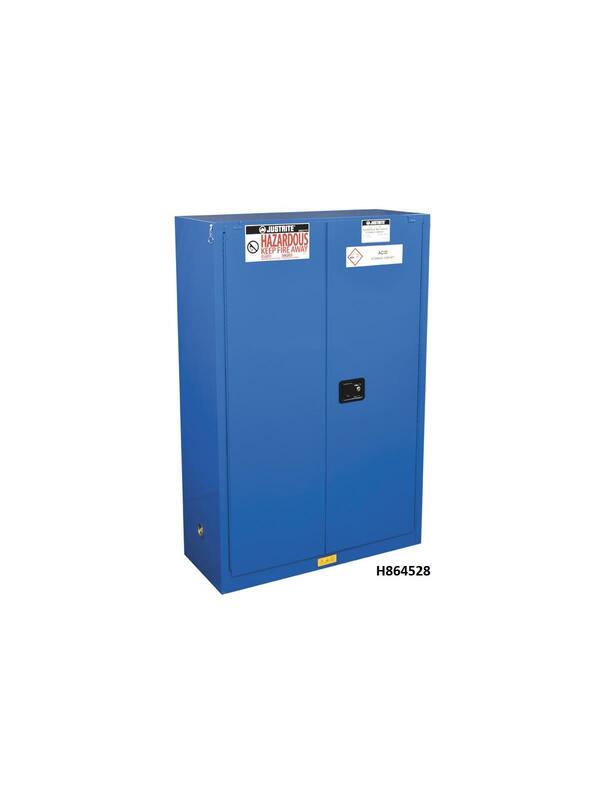 High-performance cabinets feature all-welded, 18 gauge double walled steel construction with 1-1/2" air space, a 2" leak-proof sump, U-Loc™ handle, dual vents with flame arrestors, adjustable self-leveling feet, and ground wire connector. Application-specific labels identify contents to safely store and segregate incompatible chemicals. Self closing doors with a three-point, stainless steel bullet latching system securely close for maximum protection under fire conditions. They self-index and self-latch to close in sequence to ensure a tight closure from top to bottom. For increased chemical resistance against leaks or drips, steel SpillSlope® adjustable shelves include a polyethylene tray that sits on top of the shelf, as well as a separate polyethylene liner for the bottom sump. The popular 30-gal. cabinet includes an extra polyethylene work tray that can be placed on top of cabinet for a handy work surface. Cabinets are FM approved (except for 4-gal. models), and come with a ten-year warranty. FOB Shipping Point. 65 x 34 x 34"65 34 34"